In the summer of 2017, the continental United States will experience its first total solar eclipse in nearly four decades. And where better to view this natural wonder than in the wilds of Wyoming, far from urban clutter and glare, surrounded by pristine forests, glacial rivers, and craggy mountain peaks? That’s why TravelQuest, in partnership with the renowned Teton Science Schools in Jackson, Wyoming, has created a unique adventure exploring two of America’s most spectacular national parks, Yellowstone and Grand Teton – and, of course, featuring a carefully selected site for viewing the eclipse on August 21, 2017. Join us for eight memorable days at our base camp outside Jackson as we discover the untouched grandeur of northwestern Wyoming. Traveling in small groups of a dozen or so fellow adventurers, you’re accompanied by expert naturalist guides who love to share their knowledge of the region’s geology, ecology, and wildlife. And in the evening your TravelQuest astronomer leads stargazing parties under the vast night skies. In Grand Teton, the majestic mountains from which the park takes its name are dotted with jewel-like lakes and snow-fed streams that attract diverse wildlife, including bears, wolves, elk, and bison. And in nearby Yellowstone, established in 1872 as America’s first national park, you can hike among an incredible array of geysers, hot springs and steaming fumaroles. Together, these natural treasures immerse you in an American wilderness experience that has grown increasingly elusive in recent years. And yet, as you hike up wooded slopes, canoe on mirror-smooth lakes, float down the legendary Snake River, or take in the vistas from a 10,000 ft (3,050 m) peak, you realize that the wild heart of America has not been entirely tamed. This is a once-in-a-lifetime opportunity to experience unspoiled nature, connect with like-minded travelers, and learn more about the natural beauty of America’s own backyard. It’s an intimately scaled trip, with limited private and semi-private camp-style accommodations. Spend eight days exploring the Greater Yellowstone Ecosystem with expert wilderness guides, experiencing up close the region’s unique wildlife and dramatic geology. Hike and canoe through pristine wilderness in Grand Teton National Park. 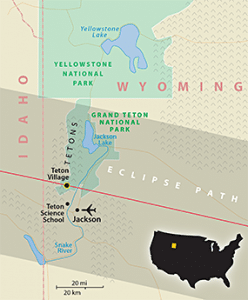 Experience the 2-minute, 20-second total solar eclipse – the first visible in North America in nearly 40 years – from a viewing point with the best weather prospects along the entire path for August 21, 2017. Unpack just once as you spend all seven nights in the same beautiful setting, enjoying the informal comforts of our wilderness base camp.